Everyone loves fruit right ? Here are 5 mouth watering ways to use fruit to sweeten up your healthy diet. 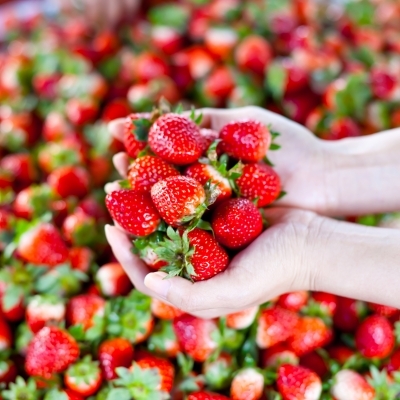 At the supermarket or farmers’ market, choose dry, plump, and brightly colored berries with no obvious rotten spots. Avoid containers with juice stains — this is a sign that the berries either have been mishandled or are overripe. Also be on the lookout for mold — it travels like wildfire through berries, so avoid containers with signs of this blue-gray fuzzy stuff. If you’ve ever bought an otherwise perfect looking batch of strawberries with just one bad one and the next day the whole box is crap, you know what I’m talking about. Store the berries unwashed in the refrigerator in a covered container. Fresh berries don’t stay fresh long and are best used within a few days of purchase ( if they last that long in your home. They don’t in mine!) Berries can also be stored in the freezer for up to four months; just spread the berries out on a cookie tray and freeze before you throw them into a smaller container or resealable plastic bag. 1- For dessert whip together a yogurt parfait! Layer non-fat, low sugar Greek yogurt with berries and low sugar or sugar-free granola. Just as good as a sundae, but won’t add inches to that waistline ! 2- You know you just want a burger and fries for dinner because salads are just so…. blah. But don’t! We are fit mammas! Add some grilled berries to a salad of grilled veggies and chicken or lean beef and you might actually enjoy it! Use a grill topper to make sure you don’t lose berries at the bottom of the grill. Serve over fresh mesclun, romaine or fresh spinach. Add nuts for a little healthy crunch and chow down! 3- Make this sweet and spicy strawberry avocado salsa and serve it as a topping for your healthy chicken , fish or shrimp. *Mix together and voilà! Foodgasm in your mouth! 4- Whip up a refreshing summer protein smoothie with fat-free sugar-free almond milk, non-fat plain Greek yogurt, and frozen mixed berries. Don’t forget to add a scoop of vanilla protein! Go easy on the yogurt and add extra ice to thicken. Too much dairy is no Bueno ! 5- Make a refreshing summer “spritzer” by mixing fresh lime juice , seltzer, and some of your favorite berries muddled together with fresh mint , basil or cilantro ! Add in a sugar-free water flavor mixer like Mio or Crystal lite for extra flavor and if you MUST add a little vodka to get the party started! My favorite is the margarita flavor! Annie Lewis is an NPC 3X overall bikini champion out of Northern California. She received her bachelors degree from the University of Nevada, Las Vegas before eventually becoming one of the top online training experts in the nation. Annie started Team Bikini Iron in 2012 and has grown her team to over 100 NPC competitors over the past few years. In addition to training competitors and weight loss clients Annie is also a regular contributor to Healthy Moms Magazine, Beverly International Magazine and Love From Magazine. She has also been featured on the Ducross Brothers radio show, HGTV, 6 Pac Abs Blog, Flex Magazine, HTFU clothing brand and many other media outlets. Mrs. Lewis has was also awarded the #1 spot in the Nation in 2012 by Bob Wild Competitor Bikini Rankings and was listed as among the top 10 social media fitness inspirations of 2015 by Livestrong.com. Annie is also an active member of the Karma Foundation. She currently resides in Roseville California with her 2 daughters and husband Brian Boatright.